Fuso has launched the second-generation Canter Eco-Hybrid into the Australian truck market. Fuso introduced its first diesel-electric hybrid model to Australia in 2009, with Sydney-based Star Track Express buying 25 units. These trucks have achieved an average fuel saving of more than 30 percent compared to their diesel-only counterparts, according to tests carried out by Fuso. "Our customers' experiences over a long period of time have clearly demonstrated that our first generation hybrid technology was capable of constantly saving significant amounts of fuel in both city and suburban applications, not only in Australia, but internationally as well," Fuso General Manager Richard Eyre says. Fuso says its second-generation hybrid comes with a "more attractive purchase price". The company says the extra cost compared with the diesel-only model can be recouped within four years on typical urban operations. "The second generation Canter Eco-Hybrid is not only cleaner than a diesel only truck, but its return on investment makes economic business sense," Eyre says. Fuso says the three litre turbocharged diesel engine and the electric motor are more powerful than in the previous model and there is no longer a power disadvantage compared with the diesel-only Canter. The new hybrid also comes with the "exceptionally smooth" Duonic clutch automated manual transmission, which can tow as much as a manual gearbox, Fuso says. The "long lasting" lithium-ion battery allows the truck to take off using the electric motor only. There is also an idle stop/start system that allows the driver to turn the diesel engine off and on at traffic lights, with the option of this system working automatically via the brake pedal. The new Eco-Hybrid also comes with Canter's 30,000km service intervals, and the whole hybrid system is guaranteed for 10 years. NSW Roads Minister Duncan Gay was glowing in his praise of the hybrid Canter at the Sydney launch. "The Fuso is just fantastic. I would like to have one as a staff car," he says. Click here to find Fuso trucks for sale. 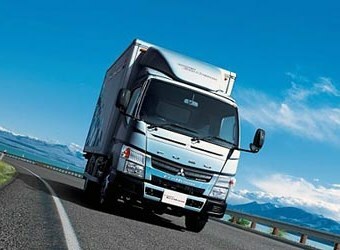 Click here to find new specs for Fuso trucks.